Carry out the following brief exercise. For English speaking British people, interpretation 1 is probably the most apparent. The term used to refer to a head covering has a long history but it is still a term that is used today – even in relation to modern sports wear. Interpretation 2 is, perhaps, slightly less obvious. The style of modern lightweight prams is somewhat different to the heavier, more robust, designs of the 1960s, and they do not always have a traditional folding hood. The term is, perhaps, less well used nowadays to refer to parts of prams. Interpretation 3 is most readily associated with American English. British speakers tend to use the term bonnet to refer to the lid of a car engine. For British speakers of English another interpretation of bonnet would also be ‘a covering for the head’. Interpretation 4 is again an American English term and one that is largely not in use today. However, it is a well known interpretation owing to the popularization of the 1930s gangster culture through modern cinema and novels. Now, suppose I ask you what the following word means? What would you conclude? Is it a word within your vocabulary? Several dictionaries list this as slang for cat (see Pragmatics for comments about slang). For some people (perhaps who have lived in the UK and who have an interest in motor vehicles) a moggie is a Morris Minor car which was popular in the 1960s. Would you have known this? How old are you? Where did you grow up? Did you own a Morris Minor? Again, who you are will influence your interpretation of words and whether or not the particular word is within your vocabulary. Finally, I have also been informed of a person in the Wirral, England who considered a moggie to be a mouse. This anecdotal account illustrates very well the often idiosyncratic meanings assigned to certain words. Even though it might be generally accepted that moggie is slang for cat, there may still be people who consider that it is not. The difference becomes an important one if this person is ordered to, ‘Catch the moggie!’. Do they chase after the cat? The mouse? Or risk being run over by a car? Semantics is the study of the meaning of linguistic tokens such as words, phrases and clauses, as in the example of the meanings conveyed by the word moggie above. Semantics studies which signs are used, how they make reference to things, ideas, emotions, and so on, and how the hearer interprets them. 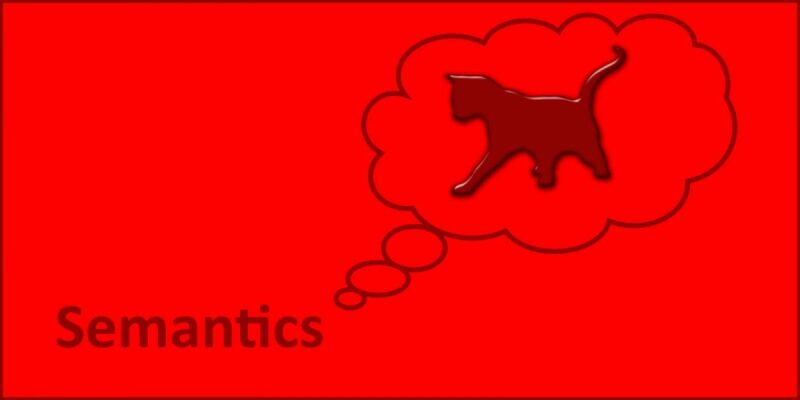 Semantics investigates vocabulary (the collection of words a person or group knows and uses) and the content of language (the topics and ideas that are encoded in linguistic messages). In addition, it considers such things as implication. For example, why is that if we say, ‘Are you going to close the door?’ this is usually interpreted as implying that the speaker is asking you to close the door and that he or she is not specifically enquiring as to whether or not you intend to close the door? In this situation a preferred response is that the listener complies and closes the door, indicates their acknowledgement verbally before closing the door (e.g. ‘Oh, right’) or offers a token apology before closing the door (e.g. ‘Sorry’). Similarly, if we say to a toddler as a visitor is leaving, ‘Are you going to wave bye-bye?’ we usually do so to imply that the child should indeed wave bye-bye. It is not that we are specifically enquiring as to the child’s intention. However, you are probably familiar with the situation where the toddler responds, ‘No!’ In this situation the child appears to have made a literal interpretation. Similar confusions may arise over the use of proverbs and idioms, i.e. generally accepted phrases that have a meaning different from the literal. An example is, ‘Well, you might as well make hay while the sun shines.’ Clearly, this phrase is not intended to mean that the listener should go and find a field of grass to mow in the summer sun. Persons with learning disabilities and some people who have suffered a stroke may have difficulty interpreting proverbs and idioms. They tend to interpret many things literally.